Putting up Rooftop Solar for your Industries / Commercial Buidings? Your location determines the amount of solar insolation (sunlight falling on the panel per day). 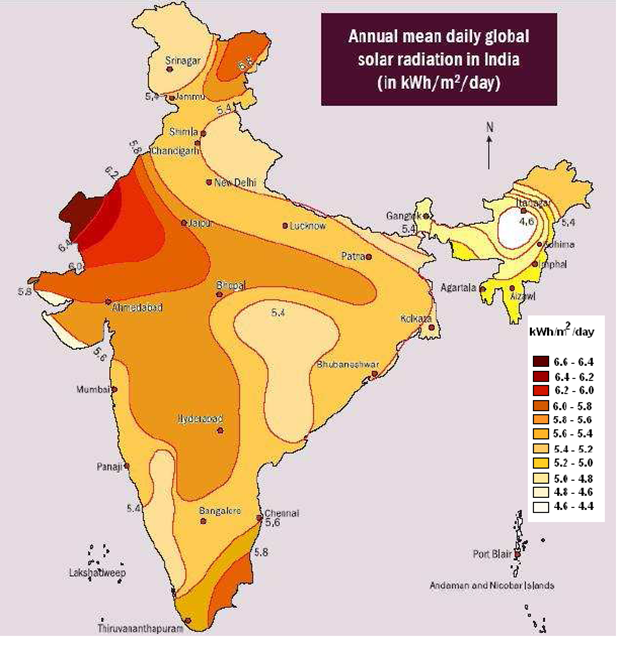 This map shows the solar insolation across different regions in India. In the northern hemisphere a south-facing roof is ideal as the sun is always to the south if you are in the temperate zone and predominantly in the south for many parts of the tropical zone. If a south-facing roof is not available an east-west facing roof could also be considered (as it will cover the sun’s movement across the sky from east to west during the day). As the output of the solar plant reduces in proportion to a horizontal angle greater than 15% from due south, the output for the particular site should be calculated and assessed to understand the impact on power generation from an east-west facing roof. Solar PV plants are not restricted to flat roofs – they can be mounted on sloped roofs as well, with a correction in the angle of mounting for the slope of the roof. Note: Efficiency of a solar panel is calculated with respect to the size of the panel, and therefore the efficiency percentage is relevant only to the area occupied by the panel. If two panels have the same capacity rating (Wp), their power output is the same even if their efficiencies are different. To illustrate: A 1KW rooftop solar plant will produce the same power output whether it uses lower or higher efficiency panels. The area occupied by the plant with lower efficiency panels will be greater than the area occupied by the plant with higher efficiency panels, but the power output is the same. The efficiency of the panels matters where the rooftop space is limited. As the lower efficiency panels occupy a greater area than higher efficiency panels, we will be able to install fewer panels in the same size roof. Fewer panels mean lower plant capacity, and therefore lower power output from the plant. The rated capacity, or power, of a solar panel (e.g. 250 Wp) is measured at 25°C. The effect of temperature on the solar panel’s power is measured by its thermal coefficient, expressed as %/K or %/°C. It denotes the % change in power for 1 degree change in Kelvin or Celsius (both are the same on a unit level) above 25°C. A negative (-) sign indicates the direction of the change. 1 KWp of panel will generate about 1,400-1,600 KWh (units) per year i.e., about 4 KWh per day. This is broadly representative of output from rooftop PV plants in India. It is an average calculated over a year. Generation on individual days at your location will vary based on meteorological conditions. PV power plant performance is often denominated as Capacity Utilisation Factor or CUF. CUF is the ratio (expressed as a percentage) of the actual output from a plant to the maximum possible output under ideal conditions if the sun shone throughout the day and throughout the year. The CUF for several solar-friendly Indian states and the approximate output per day for a 1 KWp panel (calculated from the CUF) is given below. Note: The above calculation is an estimation based on average plant performance across the Indian states. Output at your location may vary from these estimates. Amongst these 4 factors, location is not usually within our control when setting up a captive rooftop solar plant. Some optimisation is possible with the other three factors. We can, to some extent, overcome roof orientation issues using trackers. This will, however, add both to the initial cost and maintenance expenditure of the installation. The cost-benefit of using trackers will have to be carefully analysed for the particular installation to determine if it is worth the additional investment. If rooftop space is a constraint we can use panels of greater efficiency to maximise the output from the space available. Ambient temperature is not within our control, but we can help cool the panels by ensuring that we provide adequate room for air to circulate around and under the PV panels. We have seen plant performance improve significantly when panels that were mounted too close to the roof were raised to allow greater air circulation.